Romance is in the air as you share a Valentine's event like no other! Enjoy a delicious served dinner followed by a live concert of the fabulous ABBA hits you know and love. Come experience the NYC based group that will take you on a nostalgic trip back to the glitz and glamour of the '70s with their wildly popular BEST OF ABBA concert performance. These talented musicians combine beautiful harmonies, elaborate costumes, and exciting choreography with some of the most enjoyable music ever performed, into one fun and energetic show! 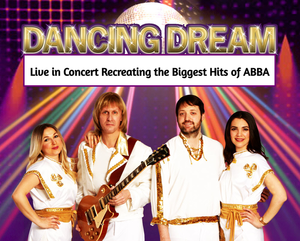 Fresh from performances in large venues across the nation, DANCING DREAM will make your Valentine's Day rock! Includes your choice from six delicious entrees, dessert, and coffee or hot tea. Ticket price includes Dinner and Show. Beverages and Gratuities are not included. Doors open 6:15pm. Concert begins at 8:00pm.